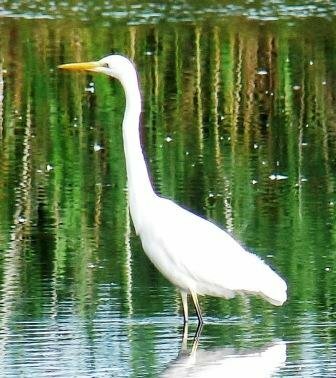 The highlight of the week flew into the Reception Hide Broad this morning; a rather fine looking great white egret, it is still present at lunchtime on Saturday, happily feeding in the relatively shallow water. I have just been told that there are four more great white egrets at Tower Hide! The other highlight of the week is seeing two juvenile red kites along with their parents close to the reserve. We suspected that breeding was occurring just off the reserve earlier in the year so to get the family all together was a great bit of confirmation, another new breeding species for the valley. The more routine species are present on the reserve; kingfishers have been seen with increasing frequency from Fen Hide and Reception Hide. Marsh harriers have fledged their young from nests across the valley, they can be best seen from Tower Hide as many of them are still in their sibling groups, look for the chocolate brown plumage with ginger crowns. Bitterns do not appear to have bred this year although continue to be seen on occasion. An otter was seen from Reception Hide this morning at 11.00, proving that they can turn up anywhere at any time. A fairly late singing grasshopper warbler was reeling near the fen boardwalk on Friday early morning…probably the last time I will hear their song this year. In July, birds are generally quite quiet in the fen, the passerines are all having a well-deserved rest after another busy breeding season and are not calling or singing much anymore, but they are still there if you look hard enough. Buckenham Marshes is providing some fine stop off conditions for passage waders with the water fast running out now though! This week wood, green, common and curlew sandpipers have all been seen on the marshes alongside a flock of 50+ black tailed godwits, ruff, little ringed plovers, greenshank and snipe…. so hotting up nicely, we just need a little more rain to top up the pools a little. The invertebrates have been enjoying all this warm weather with dragonflies and butterflies making the most of the conditions. The fritillaries and swallowtails have not been reported for a week or two now. Swallowtail caterpillars are out now and can be seen at a number of locations around the reserve, ask in reception for latest updates. Dragonflies are rapidly informing us of the moving seasons with Norfolk Hawkers now largely replaced by brown hawkers and hairy dragonflies replaced by migrant hawkers, red-eyed and small red-eyed damselflies can be found loafing on lily pads in ditches and pools around the reserve. Willow emeralds have started to emerge so we will have to see if the beast from the east hit them hard or not this year, they lay their eggs in branches overhanging ditches and only hatch in spring so would have been within the cold air all winter. Best places for willow emerald are the pond dipping platforms, river bank and between the fen board walk and railway crossing. All paths are currently open and in good (dry!) conditions, there may be some temporary diversions to the meadow trail while grazing occurs so please follow any signs in place. The water levels have dropped to late summer levels a little faster than usual this year due to lack of rain and a large amount of evaporation. We maintain a number of deep waterbodies in the middle of the fen which are well connected to the ditches, these provide a suitable water depth for fish throughout the season. The low water levels are managed for the benefit of the fen plants, these are exceedingly important for the fen and provide homes for thousands of invertebrates, which in turn provides food for the birds. The muddy edges around the waterbodies should start to attract passage waders over the next few weeks as well as good opportunities to see water rails.